The imagination is a powerful thing. At least that’s what prolific actor Nicolas Cage believes. He even goes as far as to say that his unmade Superman film by Tim Burton, titled Superman Lives, is the most powerful Man Of Steel film ever. I would offer that the movie that Tim and I would have made, in your imagination, is more powerful than any of the Superman movies. I didn’t even have to make the movie and we all know what that movie would have been in your imagination. That is the Superman. That is the movie. Even though you never saw it—it is the Superman. Cage was a good actor but became bad don’t think the movie was to be great. The best part of that movie was the documentary we got from it not being made. Tabs Carvalho well, me. Obviously. 🤣🤣🤣🤣🤣🤣🤣… of course… how silly of me. Tabs Carvalho Ok. Maybe Christopher Reeves. I found the documentary quite intriguing and i have a copy of the screenplay and I don’t think the script would have translated well to film. I mean superman didn’t fly, he jumped all over the place! No! Stop! God, why does this keep coming back? It’s like Guardia! Except even in the Documentary, he looked horrible as Superman. Reeves was Superman! 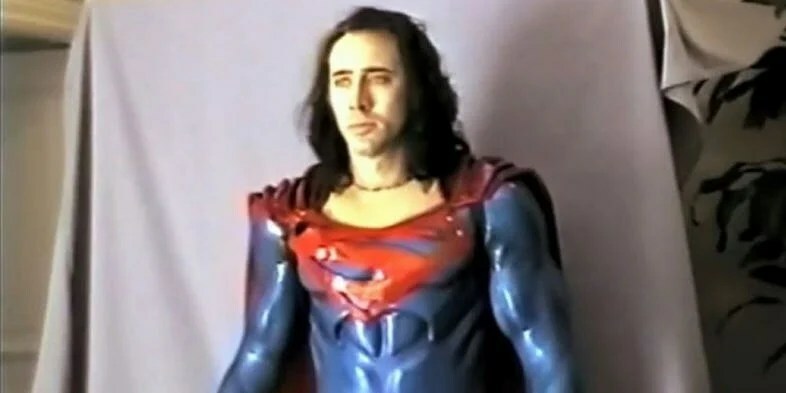 I also like Nicolas Cage and would have liked to see him play Superman.